Baratta map of 1670, detail. 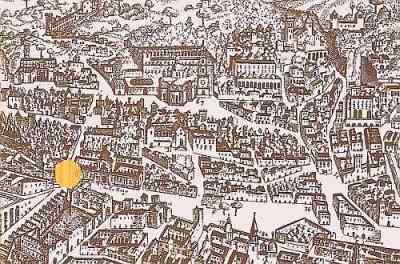 If you stand at the west end of the National Museum (the yellow dot on the map, right) you are at the northwest corner of the city of Naples as it existed in the mid-1500s after the great Spanish rebuilding of the city under viceroy Toledo. If you are looking to the north (top of image) most of the urban renewal of the period had actually been within the main body of the city behind you and along the coast. Much activity, in fact, had been directed at expanding the city walls up the Posillipo hill to the west and strengthening the fortifications along those walls. If you imagine yourself then walking out through the city gate and looking north, the well-known Lafrery map from 1566 (a century before the map on the right) shows that you will be staring at farmland, cultivated all the way back to the Capodimonte hill; at most there are a few scattered farmhouses. As you step off in that direction (that is, towards the top of the map), you'll walk up what is left of the Vomero hill as it slopes down from your left; then you'll descend into a small valley and cross it until the terrain rises to Capodimonte a short distance away. Giacomo Garzya<="" span="">a contemporary Neapolitan poet. The following poem appears in the original Italian in his Poesie ©(pub. M. D'Auria, Naples, 2011). This English translation is my own and was done in collaboration with the poet. I present it with his permission. *The Latin phrase (line 3) is proverbial in Italian and left untranslated in the poem. It is from Hadrian's poem that starts "Animulae vagulae et blandulae/hospes comesque corpis..."—roughly, "Little souls, wandering and faint/guests and companions of my body...". Even in a city and age driven by the Spanish fervor to build churches, the Sanità was exceptional. By the early 1600s, 16 large churches had been built in the area, most of them with adjacent monasteries or convents. It was essentially a race to build churches and living quarters for the faithful as they flowed out of the crowded city into a more spacious area to be physically closer to the origins of their faith. The Baratta map, in fact, shows the Sanità dominated by the presence of the large expanded church and monastery of S. Maria della Sanità (marked #67 on the above map, top center) just to the east of the road that crosses the valley towards Capodimonte. eastern part of the Sanità. The area continued to be built up in the 1700s, but then a strange thing happened. The French, under Murat, built a wide boulevard from the city out to the Bourbon Palace at Capodimonte. The road was elevated many meters above the surrounding area of the Sanità, such that your carriage ride took you over the area extending to both sides. The road was called Corso Napoleone. Eponyms come and go, and today the street is via Santa Teresa degli Scalzi, changing name along its length to corso Amedeo di Savoia Duca d'Aosta, but the fact remains that your passage from downtown to the area of the catacombs and then up to Capodimonte takes you over the Sanità and not into it. You can’t get down into it without purposely turning off and doing so. Today, turning off and doing so is something that most people tell you not to do since the Sanità is an area of social unrest, high unemployment, and all the rest. 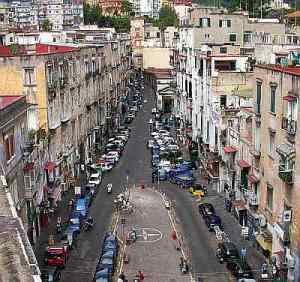 The area is run by the camorra (the Neapolitan version of the Mafia) and even the cops don’t like to venture into it unless they are accompanied by lots of other cops. 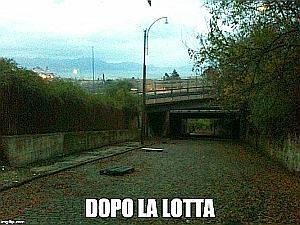 It is an area where the residents will tell you that there is a lot of good to be said for the camorra and almost nothing good to be said for the state. For some reason I am reminded of Lewis Mumford’s remark that the clearing away of the winding medieval streets of Paris by Napoleon III in the mid-nineteenth century did away with the last physical barrier that protected the common citizen from the power of the state. Here we are 150 years later in Naples, and the Sanità really is such a physical barrier, at least in the minds of some. The very isolation of the Sanità —from the fact that traffic passes over it and not through it —makes it relatively tranquil. There are some villas set amongst trees and vegetation, lending an unexpected pastoral quality in places. The area contains, as well, a number of attractions, including the San Gennaro dei Poveri hospital, an institution built in the wake of the plague of 1656. (The hospital was the true forerunner of the great Royal Poorhouse, the Albergo dei Poveri, built during the later Bourbon dynasty.) Also, the Sanità is where you find the uniquely grotesque Fontanelle cemetery with its display of skeletal remains. If one chooses to turn off and go down into the Sanità, it isn't really that easy. There is one vehicular road leading down from the main road. Or you can walk, but that isn't too easy, either; some web-savvy types in the area maintain a tidy webpage in Italian about the Sanità, featuring a running litany of comments and complaints from citizens, foremost of which at the moment seems to be the on-again but mostly off-again state of repair of the one elevator for pedestrians to get in and out of the area. It was built in 1937 and is located at the point from which the above photo was taken. In absence of that friendly mechanical contrivance, you can trudge the long way around, along that one vehicular road, or you can walk down a stairway from the lower slopes of the Vomero hill to the south. Or you can jump. Le città nella storia d'Italia, editore Laterza, 1981.
overlooking the main part of the city. The isolation of the Sanità continues to this day to the great frustration of residents of the area. As noted above, there are but few roads in or out. It's as if efforts since the early 1800s have been aimed at avoiding the area: Murat built over it 200 years ago, and the recent by-pass highway, the tangenziale, has essentially tunneled through the surrounding hills, surfaced for a few seconds to go over the Sanità, and then burrowed back into the hills on the way to the airport. Naples has (or had) a number of ancient roads in and out (better, up and down) to handle the severe change in elevation of the city (from sea level to 450 meters/1350 feet a short distance later). Some of those roads have made the change from horse-drawn carts and foot traffic rather well. One of these is the old Infrascata road; it is now via Salvator Rosa and goes from the National Museum up through the Avvocata section of town to the Vomero hill. One that has not made the change is the Scudillo Climb (image, above right). It used to be an excellent way to come down from the hills of the Vomero (what is now called the Hospital District) into the Sanità and climb back up again. over Capodimonte Palace with Vesuvius in background. Once again, to draw your attention to the peculiar terrain of the city... if you look at the image of the old map at the very top, as you pass that yellow dot and go north (to the top) it's as if you were going into a giant flat-bottomed bowl through a missing piece at about the 6 o'clock position. There is some flat space to your right, at 5 o'clock and 4 on the clock face, but everything else either clings to sides of the bowl or is spread around the rim—the hills: the Materdei hill rises on your left at 7 and changes at about 8 to the Colli Aminei hill that continues on through 9 to 11 and then shades over through 12 to 3 into the famous Capodimonte hill. It's a bowl broken open on one side and the Sanità is in that bowl. To walk or ride out of it, you went up the steep Scudillo slope from about the center of the bowl, angling over and up to 11 o'clock (where the modern Cardarelli hospital is, today) about one km away. The road has existed since Roman times and was well-known to visitors on the Grand Tour in the 1700s and 1800s because of the view it afforded of much of the bay. It was an area where a number of families of the nobility chose to build luxurious villas in the 1700s, some of which are still there. The road was, indeed, converted to modern vehicular traffic for some decades but was closed in 1987 due to the collapse of a section of a retaining wall and has never reopened. A number of very recent initiatives by local citizens have sought to highlight the problem. They have actually gone up and down the road on foot and cleared away at least some of the accumulated rubbish and debris of 30 years of malign neglect, although nature has now intervened to make it somewhat more benign in the form of returning shrubs and trees—you can get a lot of that in 30 years. 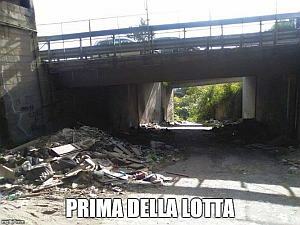 Real problems started in the 1960s with the explosion of urban construction, much of it illegal, and construction of the tangenziale highway, the “by-pass” road around Naples on the north side. Support pylons were placed directly over the Scudillo in places and massive amounts of waste material from construction was simply dumped into the area. Even before they closed the road in the 1980s, the Scudillo road had degraded into a rubbish tip and a nest of petty crime and drugs. 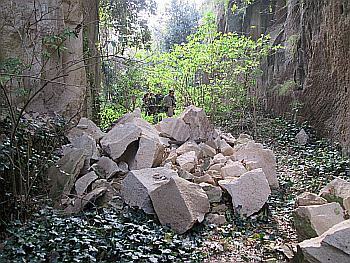 A number of private interests have manged to block attempts to restore the area. That's not as illogical as it sounds. The area is still beautiful in places (image, above left, is of a charming residential park area just off and below the road); the view is still glorious and there are private access roads to all those private pieces of property set away from the road and on the slopes and to all those private persons who want to maintain their privacy. There are practical reasons to reopen the road: tourism for one, and for another, the road is a direct line out of the city to the major hospitals on the hills around the city. There is a long list of things that have to get done in Naples, and this is obviously not very high on the list. But the city has just spent a fortune to build one of the most beautiful and least used underground train stations in the world. A small fraction of that might have been spent to restore one of the classic panoramic roads in the city. In just the few weeks since the first item on the Scudillo Slope (directly above) the popular initiative to clean up this historic old thoroughfare has made significant progress. The individuals involved are filling their webpages and Facebook postings with Before and After shots. The road is not yet open, but it will be. Volunteers went door to door to round up help, listening to comments telling them they were wasting their time because you can't fight city hall. So they went and fought city hall and got the municipal office responsible for the removal of large items (blocks of cement, boards, tires, discarded toilets...you name it). So far...Before and After look like left and right (above). Captions read "Before the struggle" and "After the struggle." Nice going.